724 pages | 56 B/W Illus. Now that Bayesian modeling has become standard, MCMC is well understood and trusted, and computing power continues to increase, Bayesian Methods: A Social and Behavioral Sciences Approach, Third Edition focuses more on implementation details of the procedures and less on justifying procedures. The expanded examples reflect this updated approach. This bestselling, highly praised text continues to be suitable for a range of courses, including an introductory course or a computing-centered course. It shows students in the social and behavioral sciences how to use Bayesian methods in practice, preparing them for sophisticated, real-world work in the field. Bayesian Methods covers a broad yet essential scope of topics necessary for one to understand and conduct applied Bayesian analysis. The numerous social science examples should resonate with the target audience, and the availability of the code and data in an R package, BaM, further enhances the appeal of the book. The book will be very suitable for students of social science … The reference list is carefully compiled; it will be very useful for a well-motivated reader. Altogether it is a very readable book, based on solid scholarship and written with conviction, gusto, and a sense of fun. This book is a brilliant and importantly very accessible introduction to the concept and application of Bayesian approaches to data analysis. The clear strength of the book is in making the concept practical and accessible, without necessarily dumbing it down. … The coverage is also remarkable. One of the contributions of Bayesian Methods: A Social and Behavioral Sciences Approach is to reintroduce Bayesian inference and computing to a general social sciences audience. This is an important contribution-one that will make demand for this book high … Jeff Gill has gone some way toward reinventing the graduate-level methodology textbook … Gill's treatment of the practicalities of convergence is a real service … new users of the technique will appreciate this material. … the inclusion of material on hierarchical modeling at first seems unconventional; its use in political science, while increasing, has been limited. However, Bayesian inference and MCMC methods are well suited to these types of problems, and it is exactly these types of treatments that push the discipline in new directions. As noted, a number of monographs have appeared recently to reintroduce Bayesian inference to a new generation of computer-savvy statisticians. 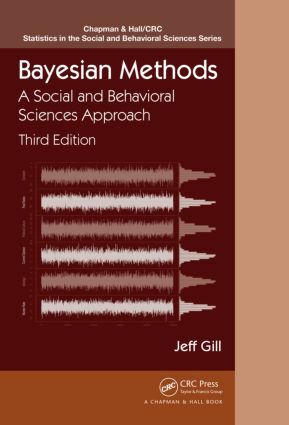 … However, Gill achieves what these do not: a quality introduction and reference guide to Bayesian inference and MCMC methods that will become a standard in political methodology. Why Are We Uncertain about Probability? Who Is Markov and What Is He Doing with Chains? Jeff Gill is a professor in the Department of Political Science, the Division of Biostatistics, and the Department of Surgery (Public Health Sciences) at Washington University. He is the author of several books and has published numerous research articles. His research applies Bayesian modeling and data analysis to questions in general social science quantitative methodology, political behavior and institutions, and medical/health data analysis using computationally intensive tools. He received his B.A. from UCLA, MBA from Georgetown University, Ph.D. from American University, and Post-Doctorate from Harvard University.